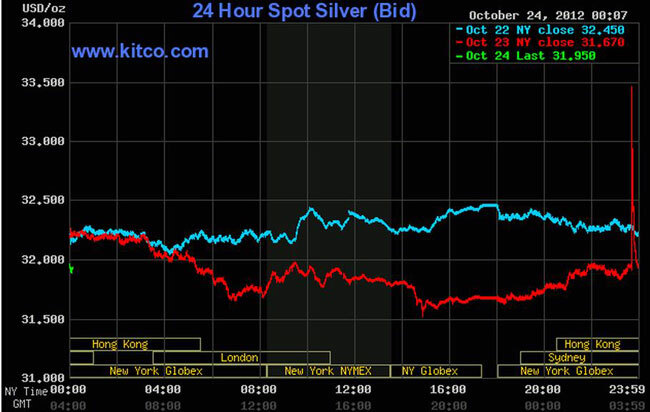 Every picture tells a story and this picture depicts the volatility inherent in the silver market. With options expiry coming to fruition this week this sudden spike must have scared the whatsit out of the shorters. We sincerely hope that they managed to get back off the window ledge in time to see the price of silver come back to a level acceptable to them. As this tiny market sector unfolds we must brace ourselves for violent oscillations in both directions. The paper players cannot afford to have prices move uncontrollably to levels that could actually destroy their positions. Options expiry is a treacherous time for all us and we must learn to sit through it and not be tempted into selling any of our silver or gold holdings. If you have purchased the physical metal and taken delivery then hold on tight. To dispose of your stash now will be giving someone else a real bargain in our very humble opinion. We are also two weeks out from the presidential election in the United States and as we all know our political masters do their very best to create a rosy, stable and prosperous looking period during the run up to this event. To have the dollar portrayed as weak and heading for junk status is just not acceptable right now. It happens everywhere, not just in the US of A, so until we get past November 7th, hang on to your hats and ride out the turmoil. There will come a time when those shorting precious metals will realize that they have adopted the wrong strategy and they will change their stance and become positive on both gold and silver prices. When this event takes place there will be a breath taking move north in prices and we will look back nostalgically at these times when bargain prices where here for the taking. Conventional wisdom suggests that a small percentage of your wealth, say 5% to 10%, should be in precious metals. As good as this advice might be to have the lion's share of our wealth placed somewhere else makes no sense to us. We are extreme in this respect, and we own no other stocks, out with the metals sector. We all need to take ownership of our finances, assess the situation and go to bat accordingly. Do not day dream here, formulate your own plan and execute it with gusto. Investment in mining stocks is usually for the leverage that they return when compared to the gold and silver. This leverage is necessary in order to compensate for the numerous risks that are inherent in the mining sector.The stocks have been showing some improvement of late; however the overall performance of this sector remains below par. Finally, if you have the stomach for it, the purchase of options where both silver and/or gold are the underlying commodities can help to turbo-charge your trading account. This is not for the faint hearted and you do need to be the right side of the move in order to maximize your profits. Your trading account should be considered as separate from your investment account and thought of as the riskiest element of your portfolio. With stocks, forming part of your core holdings, being less risky, however, we must remind you that there are numerous risks associated with the profession of mining. Owning the physical metal puts you in control and removes any third-party dependencies. Yes, you might need to buy a large dog, but just imagine how much exercise you will get. So get your head up and get into position pronto. You have been warned. This is a dip and well worth buying, prices may go a tad lower, however, you could miss out completely if try and time the bottom to perfection. This asset class has been one of the best performing sectors for the last 10 years and we believe it that trend will continue for a few at least more years to come.